The terrifying fun never has to end if you're a fan of classic B and horror movies. Julia Griffin of www.b-moviebags.com sends us a pic of her favorite hand painted leather purse. One of many that she offers on her site. 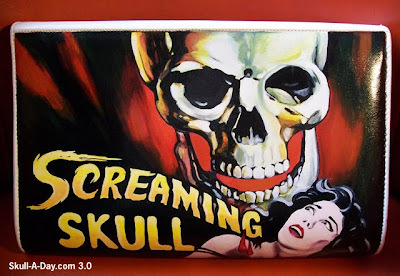 Of course the skull bag would be my favorite also, but if I were a woman, I might consider toting around the Creature From The Black Lagoon as well. Great stuff, Julia. Thanks for sharing. 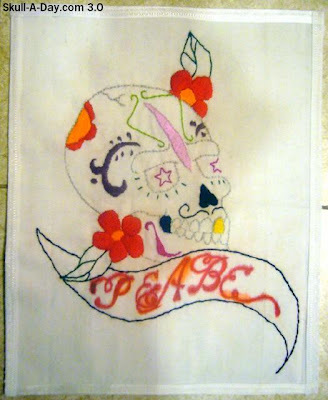 Lauren from Lo-Fi Creations sent us this skull piece she made for her friend Peabe. I am sure your friend enjoyed this as much as we did just seeing it. Thank you for submitting your work . 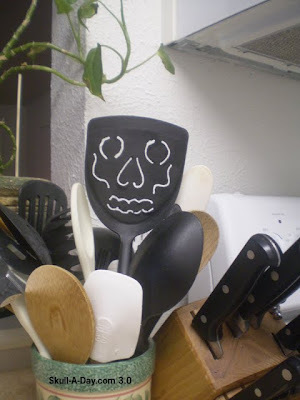 There's a new utensil overlooking the goings on in my kitchen. I carved this "skatula?" with my trusty dremel tool. Is there anything it can't do? 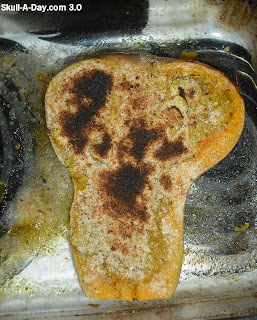 Well, except maybe flip skull pancakes. That's where the skatula comes in handy. Pudge is back at it with a tasty breakfast he recently had. 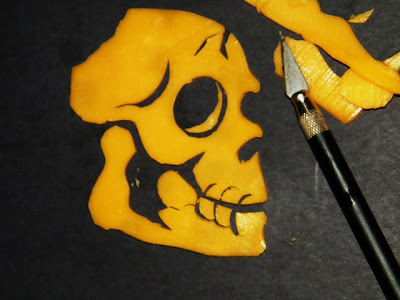 He writes, "I don't know if anyone has made a pancake skull yet, but I was eating breakfast this morning and saw inspiration. My wife, Shannon, made pecan pancakes and he tasted just as good as he looked. I wanted to make cross bones out of bacon, but we had sausage instead. Enjoy." 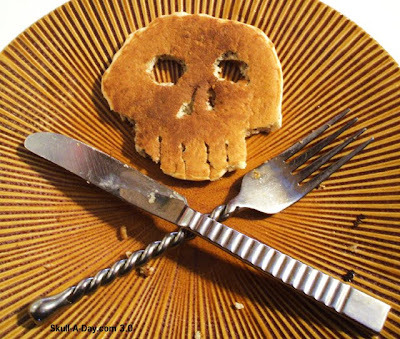 Actually, the Skull Master has made vegan skull pancakes in the past, however, they did not have the nutty goodness that yours possessed. Pudge, if you still crave bacon crossbones then just go here. And what's wrong with sausage crossbones? 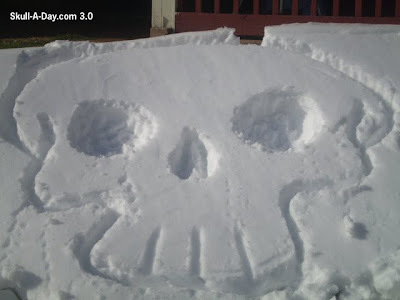 I've been documenting the demise of the snow skull that I made with my friend Paul from DudeCraft. 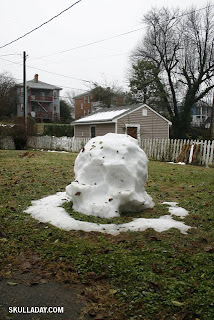 Generally snow doesn't last very long in Richmond and it almost never comes this early in the season, so it wasn't a big surprise that it's almost entirely gone in just over a week, though I was impressed how long it retained its original shape despite several days of intense sun. I'm guessing there won't be much of anything to photograph in two more days. It was fun while it lasted! 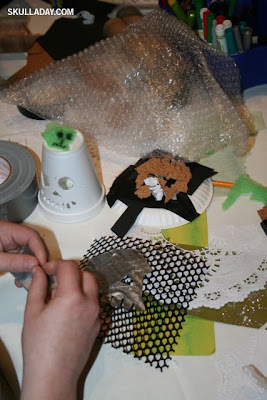 FYI the original post, with "making of" photos can be found HERE. 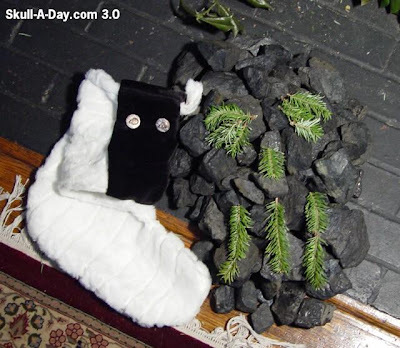 This week’s offering is Coal and Conifer. “Naughty List” 10" X 7.5" West Virginia Coal and recycled spruce branches arranged. As this holiday season wraps up for another year, I thought I would share one final holiday tradition with you, the Christmas Stocking. When I awoke Christmas morning, I found my stocking filled with coal. You know what I always say... When life gives you coal, make diamonds. 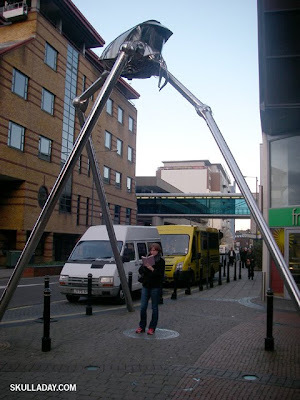 Adin (aka @vesper385) recently got one of my Modofly journals (featuring my Interlocking Skull pattern) and sent this awesome picture of herself with it underneath a War of the Worlds tripod in Woking, Surrey, UK! This is a beautiful piece you created. 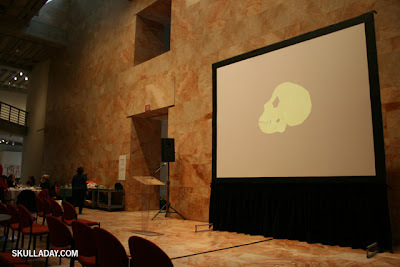 I am drawn to the soft, lighter than air appearance of this skull. Thank you for sharing it with us. This week's round of simulacrum come from (almost) everyone's favorite woody perennial plant, the tree. Now these are not tree skulls as you might think, but they are all made possible by the loveliest thing that Joyce Kilmer ever saw. 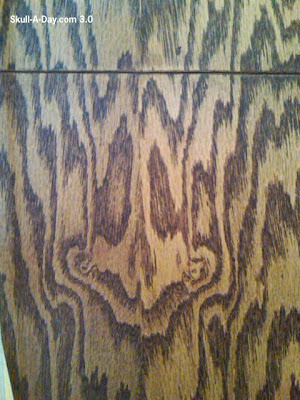 First is this bit of woodgrain found on an entertainment center by Jana in California. Jose Miguel Alvarez was visiting Barcelona, Spain when he discovered this newspaper skull on the ceiling at a bar called Le Journal. And finally, Jeremy Laura of Karma Body Art in Monroe, Michigan keeps finding skulls on his paper towels that he uses while tattooing. 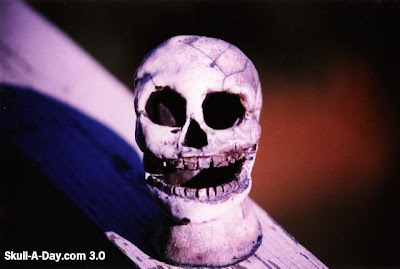 He writes, "A while back I noticed, while I was tattooing, that from time to time when I unfolded my paper towel, a skull appeared from the way it was folded and the ink was wiped. I decided that next time I found a good one, I would send it in. This isn't the nicest one I've discovered, but it is the best one in a while." 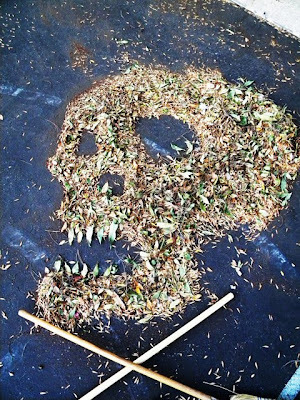 I think that I shall never see, a skull as lovely as a tree. Although a lot of you are coming pretty close with your finds. Thanks to all of you skull hunters out there for the finds. Keep them coming to the submissions inbox and don't forget that since we only do this once a week it may take a little longer before it gets posted. 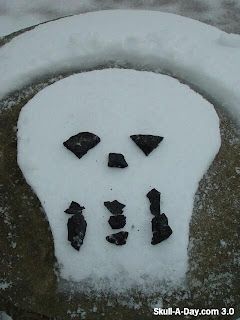 Today's skull was a tag team effort from John-Paul & Renee Albinati of Williams Lake, British Columbia. 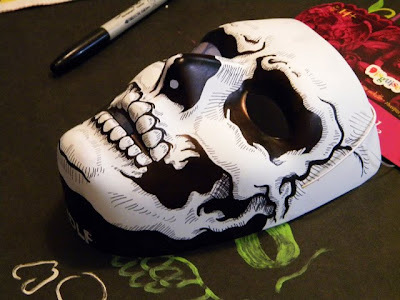 They painted this mask for a friend's son. I'll bet he has the most intimidating mask of the league. Score a goal and an assist to the Albinatis for their great work. If you are new to the hockey mask art wave then check out this site for more of the NHL's best mask art. Thanks for the submission John-Paul & Renee. Remember kids, always keep your stick on the ice, and not on someone else's skull. 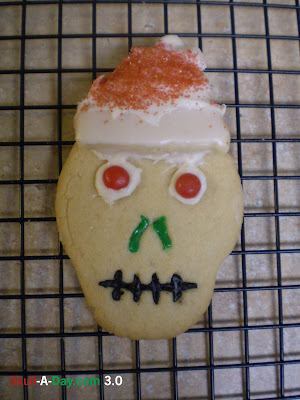 Also, my wife was in the Skullmas spirit so she made a Santa Skull sugar cookie to wish all of you a Happy Skullidays! I found this guitar pick on the floor of a bar in NYC and carved it with a Dremel Tool. I'd love to mass produce these, anyone have a connection to a guitar pick company that might want to license the design? 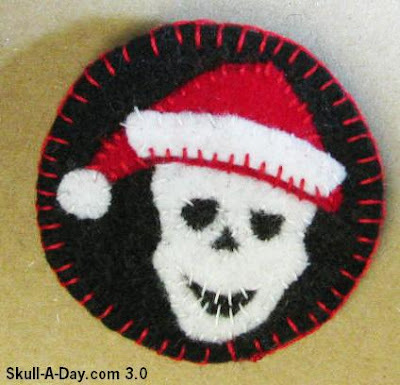 All of us at Skull-A-Day would like to wish all of you Happy Holidays & a Happy New Year. 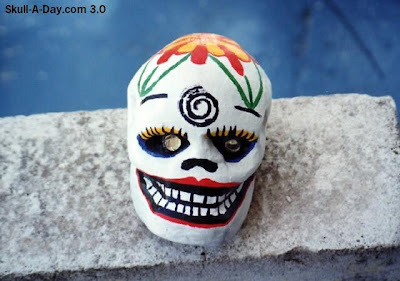 Elizabeth Valdes Morales sends us holiday greetings from Mexico with this skull. Joanne Dhody of Design Unlimited made these patches for everyone on staff at the Mütter Museum of The College of Physicians of Philadelphia. 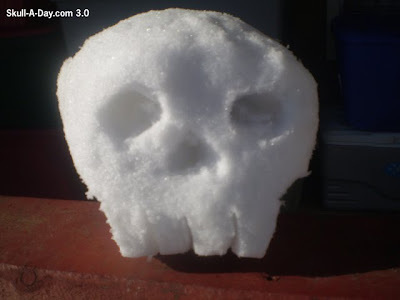 Longtime fan of Skull -A-Day, Larry Pearson sent us his Holiday wishes. Thank you all for submitting your holiday skulls for us to share. Wishing you all the best today, and always. Mike says he "Made this out of mini Rubik's Cube keychains, so I had to make it a 9x9. 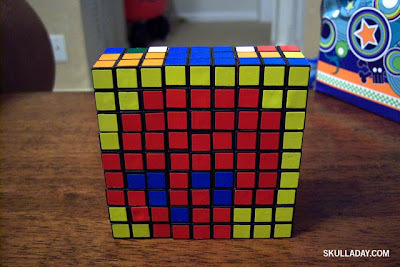 I'm going to do this with full sized cubes and frame, as soon as I get 9 new cubes, I'll share that when it's done." Jeff Thorsgaard of North Dakota has set the mark of achievement in the trailer hitch cover/plug world. Jeff tells us, "It is life-sized, and has a barbed-wire "Crown-of-thorns"...we call it "King of Pain" It is a receiver hitch cover/plug. A heavy one! 21 pounds!" I really dig this one for three reasons. 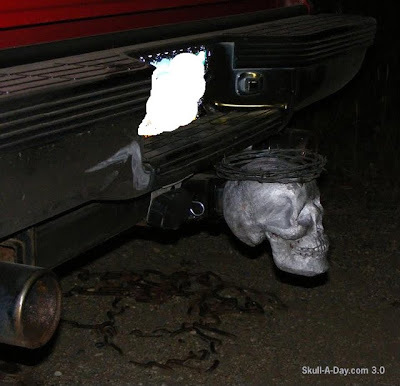 It's a skull, it's a truck accessory, and it is literally HEAVY METAL! (how many of you were fooled by the title?) Plus, if someone were to rear end him then they would have a skull imprint on their bumper. Awesome work, Jeff! 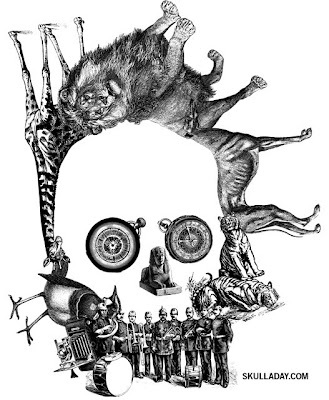 Arranged Victorian illustrations. 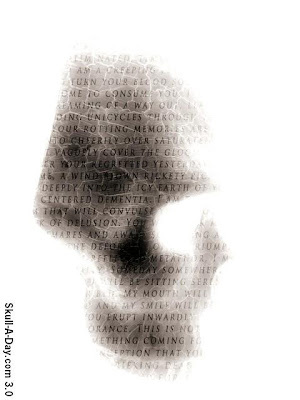 I created this as a proposal for a client project, but it wasn't used, so now it's an official part of Skull-A-Day. I think I may need to make a print out of it. Interested? [UPDATE] I can't make a print because the art is going to be used commercially. I'll provide the details when I can share them! 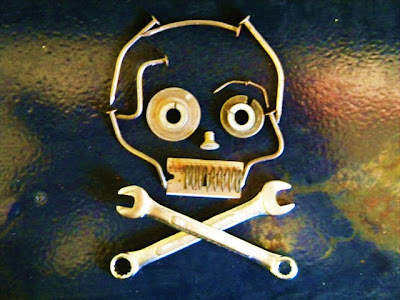 Karen Applegate from Portland, OR sent us these skull pieces. Before I run “OUTATIME” here I just wanted to tell you how much I enjoyed seeing this two pieces together. I really like the style of skull you do that includes the tiny individual teeth. 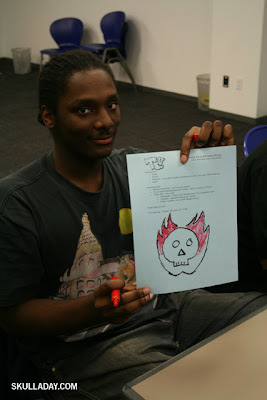 Thank you for submitting your work for us to share. It's still that time of year again. 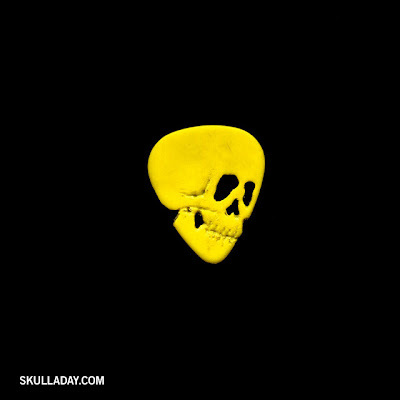 I hope all of you are having the happiest of Skullidays! 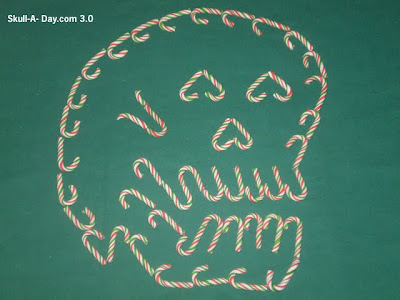 I used mini candy canes to make this cheery fellow. My 4 year old son only ate two of them in the process. 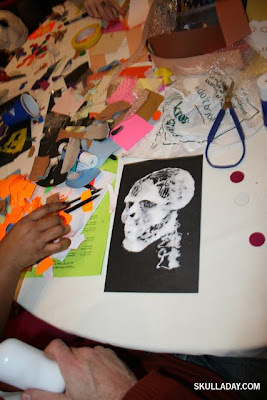 I did three talks to teenagers about skulls this month! 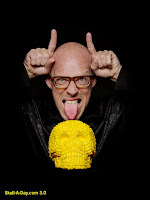 I am available to do talks/workshops in other cities, so if you know of a university, museum, or group that would be interested in bringing me out please get in touch. This delicious looking piece of confection comes from artist Royalsteez. 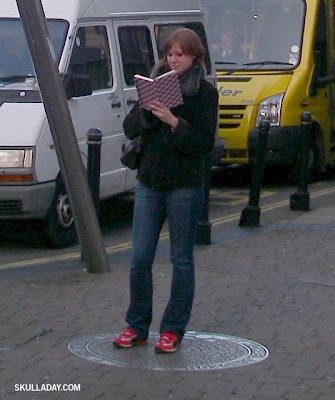 He tells us, "Last year Damien Hirst exposed his 'For the love of God' in Amsterdam. 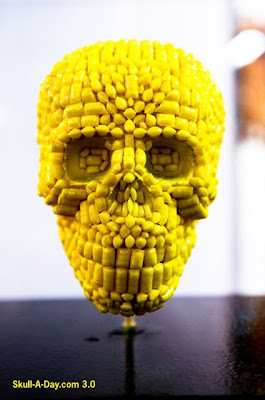 I immediately was inspired to cover a skull with yellow handmade sweets (passionfruit flavour) and exposed it not more than a mile away from the real deal. I gave it the name "For the love of Candy". Seriously, that is pretty sweet. Excellent work! This week’s offering is Caramel. 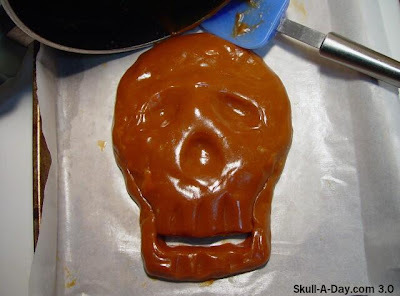 “Sugar Great-Granddaddy” 8.5" X 6" handmade Caramel Candy, molded. I wanted to explore another Christmas tradition this week and decided to choose the experience of making candy. Wow! What an experience it was. I commend anyone who does this on a regular basis. Caramel is a temperamental item to cook and to play with, but if you want to give it a go here is the place I got my info from. Just a word of warning, watch out for boiling sugar, and don't worry, great-granddad will find a good home this holiday season. You should definitely add 365 Skulls to your daily reading list if you need more skulls in your life! With today being the official first day of winter I thought these snowflakes would be appropriate to share. I really like the look of these skulls. They fit in very well for their intended holiday use. Thank you for sharing them with us. If any of you get the desire to start making your own snowflakes on this first day of winter, here are great instructions of how to fold the paper to get the correct number of sides. Also to our friends in the Summer Hemisphere, happy first day of summer, but think cool thoughts with some snowflakes. 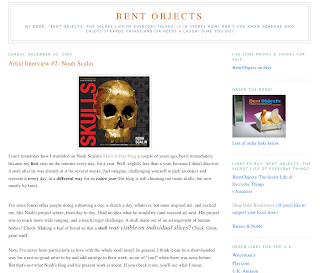 My friend Terry Border recently interviewed me as part of a new series on artists he's doing on his fantastic Bent Objects blog! 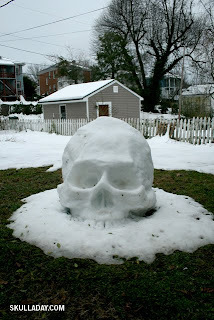 We had a little bit of snow here, and being inspired by the Skullmaster’s 373. 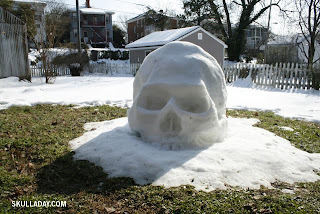 Snow Skull I set out to make my own. I had no idea that when I got home last night I would find 374. Wow how can I top that? Today's skull is dedicated to all that has happened this week in Copenhagen, did anyone else find it interesting that President Obama left the conference early to avoid the pending winter weather? 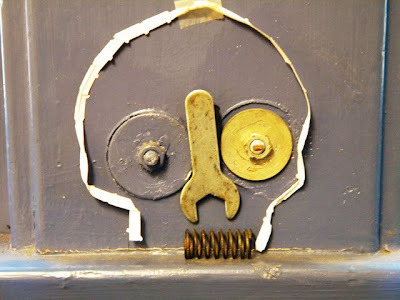 I left this skull where I made it for others to find. 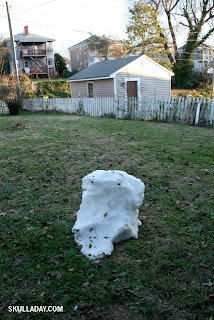 If no one disturbs it, the coal will remain after the snow is gone a fitting commentary on the future of our winter enjoyment if we don't act to seek out energy alternatives to coal and cut our greenhouse emissions. 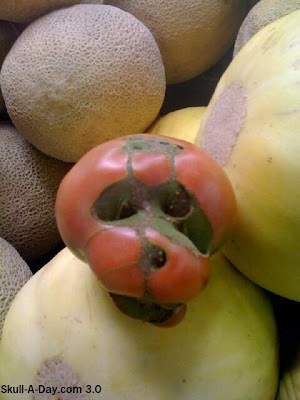 You are going to love today’s simulacra a bushel and a peck. 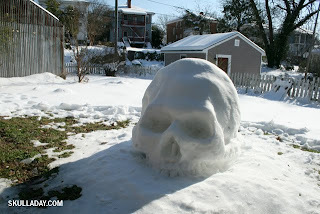 Another round of great skulls brought to us by mother nature. It seems like it has been a long time since the summer markets, but before we know they will be open again. Thank you all for keeping your eyes peeled (especially you Miranda) for simulacra and taking the time to submit your finds. 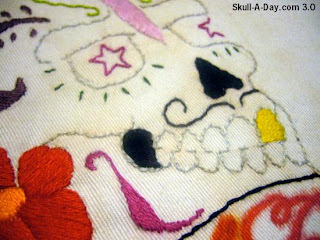 Skull-A-Day Press: No Bones About It!